Central to everything. Apartment was very clean and nice and has everything. Location, modern kitchen, and the huge roof terrace are awesome. Nice, new, great location, family friendly, kitchen and laundry. This was an apartment so it was very roomy and had 3 nice balconies with great view. The location is central. Many attractions like Sagrada Familia and La Rambla are about 30 mins walking distance. Served very well by Bus/Metro closeby. 24 Hr supermarket underneath. Area and Building seemed safe and the level of noise was reasonable. 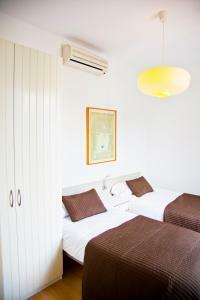 Great A/C units in both bedrooms and living area. Kitchen had Microwave, Toaster, Pots, Pans, Cleaning Supplies. Washing machine and Refrigerator were helpful. Ample closet space. Comfortable beds. Felt like a home away from home, Good restaurants and bakeries nearby. Lovely spacious apartment with a huge roof top terrace, ideal for travelling with children. The location is great, we were able to walk to most of the sights. On the day we left the hosts stored our bags for us as we weren't flying out until the evening. Lock in a great price for Claris Apartments – rated 9 by recent guests! One of our best sellers in Barcelona! 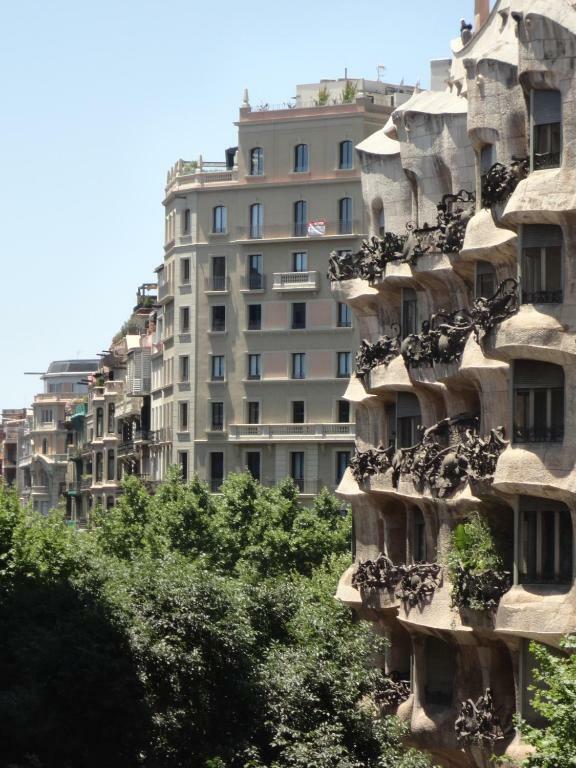 Offering views of Gaudi’s famous La Pedrera building, Claris Apartments are 500 feet from Passeig de Gràcia Avenue and a 4-minute walk from Diagonal Metro Station. The modern air-conditioned apartments offer free Wi-Fi. The spacious apartments have a living room with a sofa bed, flat-screen TV, CD player and iPod docking station. There is a hairdryer in the bathroom. The kitchenette includes a fridge, microwave and coffee maker. Due to the central location, you will find many shops, bars and restaurants in the immediate area. 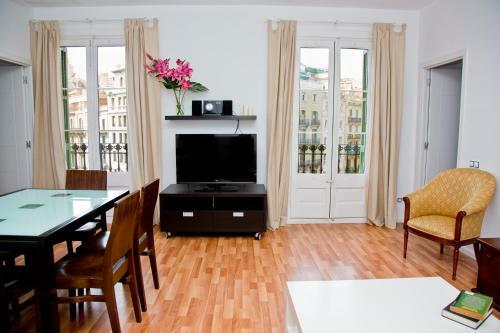 Plaza Catalunya and La Rambla are a 10-minute walk away. When would you like to stay at Claris Apartments? 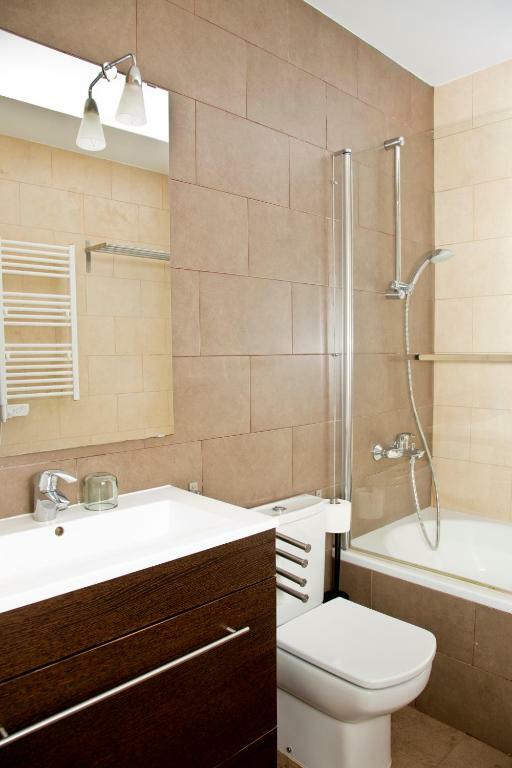 Modern air-conditioned apartment with a 33 ft² interior terrace and free Wi-Fi. The spacious apartment has a living room with a sofa bed, flat-screen TV, CD player and iPod docking station. There is a hairdryer in the bathroom. The kitchenette includes a fridge, microwave and coffee maker. Modern air-conditioned apartment with a balcony and free Wi-Fi. The spacious apartment has a living room with a sofa bed, flat-screen TV, CD player and iPod docking station. There is a hairdryer in the bathroom. The kitchen includes a fridge, microwave and in some cases, a washing machine. This modern, air-conditioned apartment has a balcony and a living room with a flat-screen TV and a double sofa bed. The kitchen includes a fridge and a microwave and some apartments have a washing machine. There are either 2 twin bedrooms, or 1 twin bedroom and a queen-size room. This modern, air-conditioned apartment has a private sun terrace. The living room comes with a flat-screen TV and a double sofa bed. The kitchen includes a fridge and a microwave. Some apartments have a washing machine. At Claris Apartments you will be in one of Best locations in Barcelona. 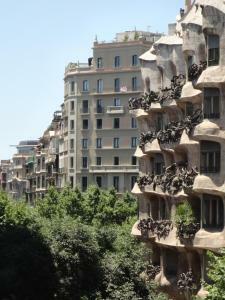 Overlooking La Pedrera and next to Passeig de Gracia. Spacious, luminous and fully refurbished and equipped apartments with very competitive rates. We have compromised and friendly staff that will receive you directly at your destination and assist you with any enquires you may have during your stay. House Rules Claris Apartments takes special requests – add in the next step! A EUR180 damage deposit is required on arrival (around USD202.38). This deposit will be fully refunded at check-out, as long as there isn't any damage to the property. Claris Apartments accepts these cards and reserves the right to temporarily hold an amount prior to arrival. Please let Claris Apartments know your expected arrival time in advance, using the email address provided on the booking confirmation. Check-in take places directly at the apartments. There is a surcharge of EUR 30 to check-in after 20:30. Please note that pets are allowed on request, for an extra charge of EUR 50. Please note that when booking 3 apartments or more, different conditions and additional supplements may apply. Please inform Claris Apartments of your expected arrival time in advance. You can use the Special Requests box when booking, or contact the property directly using the contact details in your confirmation. A damage deposit of EUR 180 is required on arrival. That's about 202.38USD. This will be collected by credit card. You should be reimbursed on check-out. Your deposit will be refunded in full by credit card, subject to an inspection of the property. The towels were a bit cheap. Great location and nice sized apartment. Very good price. Sylvia and the other staff were very accommodating and help us with our luggage delivery after the airport lost it. Gave us good directions to get from airport to hotel and helped us print our boarding passes. Everyone was great. Great roof terrace. Amazing view. Top location. Close to shops, bars and underground. Runs out of hot water fairly quickly with group of 4. If you keep your showers short (which is good anyway) it is fine. The friendly welcome from Ivana. The layout of the apartment,which suited our family perfectly. Nothing - we loved this apartment and will be returning! The apartment was spacious, in a great location close to local restaurants and cafes and a 24hr supermarket across the road. It’s central to the city, so landmarks and Las Ramblas are walkable distance or a short metro journey away. We had everything we could’ve possibly needed - oven/microwave/fridge/safe/TV/towels and everything was clean and working perfectly. Good location , great terrace!! Location is excellent and the accommodation is good quality, good facilities. 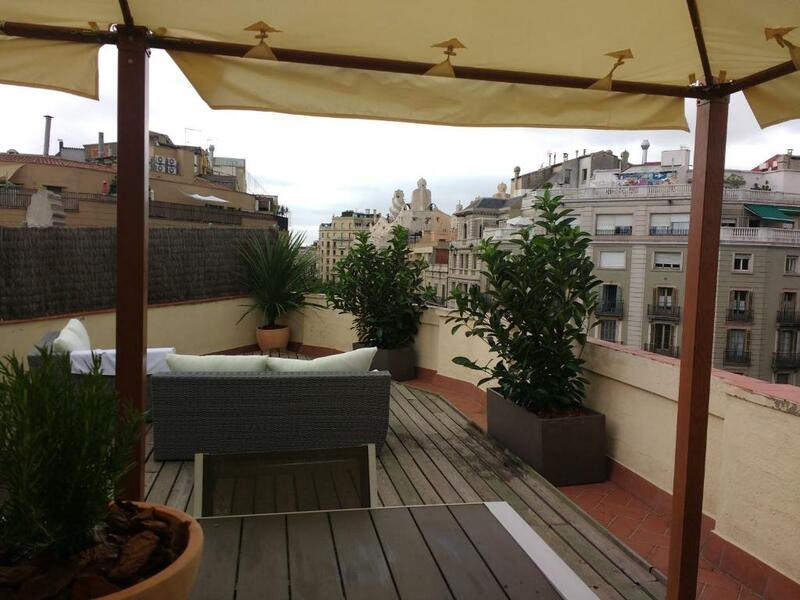 Thank you for the lovely flat overlooking La Pedrera!! Hot water may run out. loud street noise at night. The shower heater is not warm enough and goes off, probably because of the old building structure or the number of residents in the building. The toilet could have been cleaner, there was a smell in the bathroom which does not go away, we had to open the bathroom window for air to circulate. The bathroom could be slippery, rubber matting on the bath tub would be appreciated and bathroom rags would also be nice to have to keep the floor dry. The apartment was very central and is in the quiet neighborhood. There are a lot of good restaurants around and Passeig de Gracia is just a street away. The bedding linens are comfortable and clean. The size of the apartment is very good, spacious enough for 5 adults staying for a week. The kitchen is well equipped and there is also a laundry machine should you be need to laundry your clothes. The hosts can be easily contacted and are available at the reception area should you be needing help. It was also nice of them to book a taxi going to the airport for an early schedule flight. Early communication prior arrival was also very much appreciated. The elevator only goes to floor 4 and apartment is on floor 5. It was also a little dusty. The window in the first bedroom would not open and this was annoying as you couldn't let any fresh air in. Nice location. Apartment well equipped.